When you think of festivals chances are you picture muddy fields, stuffy tents, stinking pissheads and copious amounts of cider. Well, Primavera Sound destorys this vision – mostly in a good way. Set in what some refer to as a glorified car park, but what I viewed as a pretty spectacular concrete space, the festival comprises at least half a dozen stages – with the two furthest apart being about a 15 minute walk. Some came for the Spanish sunshine but for most it was the impeccable line up. Not only was it Pulp’s first reunion gig, something I’ve been waiting for for over a decade, but it also saw the likes of Grinderman, PJ Harvey and The National. Unsurprisingly, these proved to be the highlights. But there was plenty going on across the site on the Pitchfork, ATP and Jaegermeister stages, including James Blake, Caribou and Battles. The first night was all about Grinderman. Nick Cave has to be one of the best frontmen in the world. His sexual energy and masculinity ooze from his bent body as he spits the words to songs like Kitchenette. Along with sidekick Warren Ellis, who looks like a bizarre cross between the ‘follow the shoe’ guy from Monty Python’s Life of Brian and Josh T Pearson Grindderman are on fire. Cave knows how to work the crowd and made sure they were as highly charged as him as he blasted through a top Grinderman set. Post Grinderman times saw the most seamless DJ set from US group Girl Talk, who took the party right through til sunrise. One of the main draws for me was The National, after I missed their Bristol gig in November, and boy did they hit the spot. The baritone vocals and anthemic sound made for some pretty emotional numbers, including Start A War, Bloodbuzz Ohio and Apartment Story. And for those who missed out on Sufjan due to the ticketing farce, they brought him on to accompany them through a tear-jerking version of Afraid of Everyone. Of course, The National aren’t all about the balladry and they upped the tempo with the emotive Mr November. Well worth the wait. I was fortunate enough to get to the front centre for Pulp and the atmosphere was electric. Jarvis Cocker cast his iconic shillouette before launching into Disco 2000, to the sheer joy of the whole crowd. They then treated us to a faultless greatest hits set with Pink Glove, Something Changed, Babies and of course, Common People. It was one of those moments that will go down in rock’n’roll history and I feel genuinely privileged to have been there. The kind of gig that leaves you buzzing for days, like Neil Young at Glastonbury or last year’s Suede reunion gig. Methinks more bands should go awol for 10 years and come back like this. The final night belonged to PJ Harvey. The unfortunate thing about PJ Harvey is that, wherever you see her (except Evershot Village Hall back in 2004, yes I’m boasting) there are always, always some duds stood there chatting. 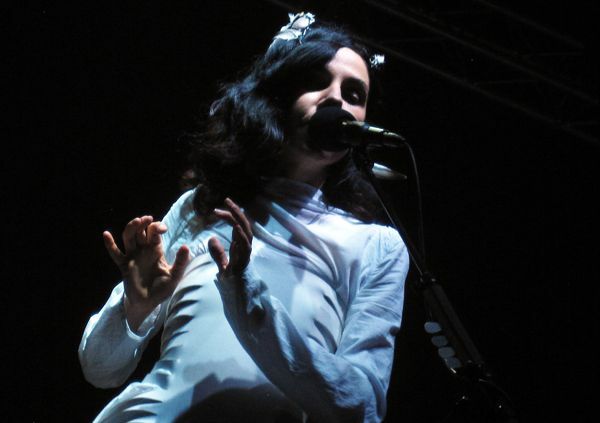 With many acts you could block it out but with PJ Harvey and her pitch perfect, stark songs you really need to focus. Her new album, Let England Shake, dominated the set with The Last Living Rose and England resonating through the Parc del Forum with an undeniable beauty. Supping on my 8th pint of JD and ginger of the day I couldn’t help grinning at the prospect of ‘take me back to beautiful England’. Music aside, there were a few teething problems. The festival has grown considerably in recent years and now sees over 100,000 punters passing through the gates over the three days (or five if you count the pre and post Primavera events elsewhere in the city). This year they decided to implement a cash free payment system, whereby you load up your entry card with credit to use at the bars. Until about 10pm on the first night no-one had any drinks cos a) the queues to top up where n hour long b) the card system failed c) you could only pay with the correct money d) no one knew what the hell was going on. There was also the issue of having to pre-book through an online portal for gigs in the Auditoria, which included Sufjan Sevens, John Cale and Mercury Rev. Which would be bearable, just, haad the portal been working. Another technology fail. Hell, you pay to go to a festival, you don’t expect to then have to pay extra for tickets for certain gigs. This just goes to show how technology can ruin a festival. Keep it real! That said, Primavera is without a doubt, one of the best festivals in the world. Had the technical problems not happened and the watery San Miguel been swapped for some decent Thatchers cider (and halved in price) then this could well clinch the title of the best festival in the world. Video highlights from PJ Harvey, The National, Interpol and Yuck available HERE.